A resident of Marietta in the US state of Georgia, Indian American Uma Lakshman is a data engineer by day and an activist entrepreneur by night. Multi-talented Uma, the Global Ambassador for Parenting 2.0, is actively involved in several non-profit pursuits. 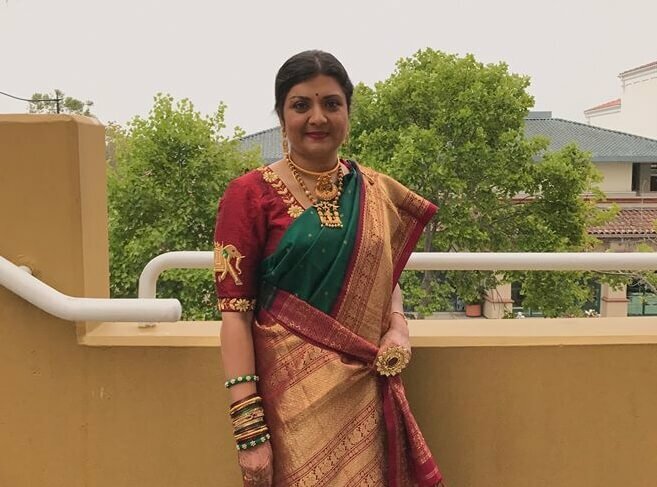 She kick-started SDNARI in San Diego to help the South Asian women in need before she laid foundation for Big Bangles Theory to create a niche market for handmade bangles from India and other countries. Trademarked in the USA, Big Bangles Theory is the culmination of her blend of compassion and entrepreneurship inspired by trekking in the Himalayas during her backpack trip through India. Uma is also a good singer, dancer and a poet. We at Indian Eagle catch up with Georgia-based Uma Lakshman to share with you her views on women entrepreneurship, how to revive endangered handicrafts of India, how she seeks to impact the lives of struggling artisans through her socio-entrepreneurial venture, Big Bangles Theory and a lot more through a freewheeling chat with her at Travel Beats, a leading portal for Indians in America. IE. How did you hit upon the idea of popularizing a certain type of Indian handicraft in the US? Did it happen one fine morning? It had been brewing in my subconscious self for until I realized it one fine morning. Indian handicrafts have been in the USA for a decent period, but the thought of popularizing Indian handcrafted bangles with custom sizing in the USA is, indeed, for the first time. IE. What made you pick Indian bangles and work towards promoting them thousands of miles away from India? Most of us express ourselves with our hands, and so do I. Human hands are unique and reveal a lot about us. The book “Louder than words” by Joe Navarro sheds light on how our hands can give clues to what is going on in our heads. The bangles you wear to accessorize your look and complement your attires do say a lot about you. I love physics and admire art at the same time. Being a social entrepreneur and a dreamer, I was in quest of something that could cater to both of my interests: science and art. It culminated in the inception of Big Bangles Theory, which combined art and science into a fashion revolution in the United States. IE. How did the initiative ‘Big Bangles Theory’ start and gain momentum in USA? Did any difficulty or challenge come your way? I started a Facebook group initially not knowing where it would go. I wanted to keep it private until I knew what I wanted to do with it. I reached out to my friends and their friends and so on. We are thankful to many well-wishers including friends and strangers. We worked hard, being in front of people at shows. We had a kickstarter campaign launched and press releases. It took a lot of hard work to get the word out and to get my website up. It’s not over yet. SEO, social media marketing and other forms of marketing are in progress as well. IE. What is the current scenario of Big Bangles Theory? Has it improved in comparison to the inception or the initial phase? Definitely, we are growing in popularity. Big Bangles Theory is recognized as the brand for bangles in the USA. We would though like it to go more viral. Hope someone out there like Oprah, Arianna Huffington, Ellen Degeneres will read this and reach out to us. More importantly, we want women to recognize Big Bangles Theory as their favorite destination to shop for the bangles that fit their wrists. Women came forward and said that they had almost given up on bangles due to size issues. It was the first time they wore bangles that they purchased from us. For the first time, bangles sized xxxs-xxxl have been made possible. IE. Who are the target audience of your initiative? Only Indians in America? Or Americans as well? Big Bangles Theory is a global initiative for all women across the world. We would like to record every woman (and men too) their hand sizes on our website. IE. What way do you reach out to the target audience with a treasure of handcrafted bangles from India? We adopted myriad ways like brand awareness campaigns, social media marketing and blogging. We took to Facebook, Twitter, Instagram and LinkedIn with our mission and vision. We attended community events and communicated our initiative to the people there. Word-of-mouth marketing is the most effective way to reach out to more and more people in our target groups. IE. How big is the market for Indian handcrafted merchandise in USA given the fact that Indian Americans make only 1% of the total US population? Though the Indian American population is very small, the love for bangles is universal. Maybe, one out of every 100 women will tell us they don’t care for bangles. We are okay with that; we know they will come around sometime. Most of these women had given up on bangles due to ill-fitting and size issues, which we have been able to solve. IE. Have you made any celebrity or eminent personality wear Indian bangles in USA? It was a pleasant surprise for us to see Hillary Clinton wearing our bangles when she visited Atlanta during the presidential campaign in 2016. Our initiative was just 6 months old. Just imagine! 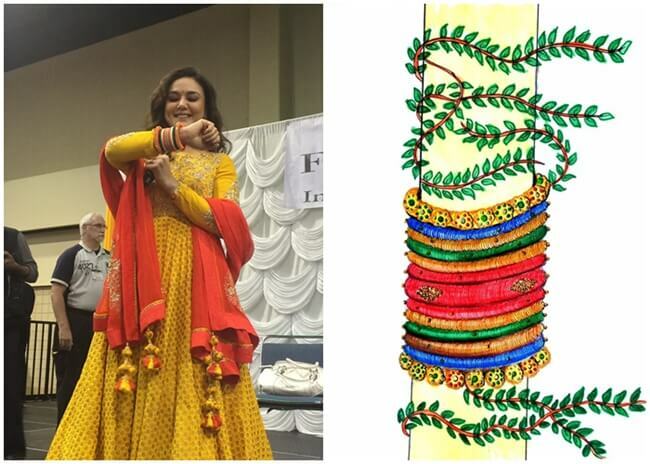 Preity Zinta, a popular Bollywood actress, wore our bangles and showed it off to everyone. We have a huge following among the common people like you and me, and they are our biggest stars. We would love other celebrities known or unknown to come forward, endorse us and show it off. IE. Undeniably, India has a colossal treasure of handicrafts from historic eras, tribal belts and rural backwaters. The beauty of Indian handcrafted knickknacks seems to be faded or lost in the glitz of urban lifestyle. What do you think (what’s your take on it)? I believe that most handicrafts had a functional purpose at the time they were created or originated. With changing times and with probably a loss in their relevancy to our current lifestyle, they might have been forgotten. But if we are able to gently bring them back in some or the way that befits our choices and lifestyle in the current era of fusion fashion, I believe they will never die out. IE. How can we save the dying or endangered handicrafts of India, and push them into the urban landscape? Fashion fades in and out. But if we are able to find a way to design the handicrafts so that they have a functional value combined with artistry or a metaphysical meaning in our day to day lives, it will be accepted more into the mainstream lifestyle and fashion. Well! We are happy to announce the launch of Big Bangles Theory. We suggest and request women to get our sizing kit and register their bangle size at our site either by requesting the sizing kit, sizing app or simply measuring a bangle that fits. We refund the cost of the kit as a coupon that can be applied towards their purchase. We hope to also offer Bangle designing services in the near future for a nominal fee. We have launched recycled bangles from San Diego, woven bracelets from Columbia and the rest is all handmade in India. A lot more to come. Travel Beats is a digital publication by Indian Eagle, a leading travel booking partner of Indians in the USA. Travel Beats represents the Indian American community and caters the latest visa, immigration, travel, and community news to them. We at Indian Eagle not only strive to make US to India travel cheaper but also celebrate achievements of Indians in America and give a shout out to noble work by Indian philanthropists / social entrepreneurs in the US.